SILVER SPRING, Md. — Government medical advisers said Monday it's too soon to ban a type of breast implant that has recently been linked to a rare form of cancer, saying more information is needed to understand the problem. The Food and Drug Administration panel didn't recommend any immediate restrictions on breast implants after a day reviewing the latest research on the risks of the devices, which have been subject to safety concerns for decades. The FDA has been grappling with how to manage emerging science that shows the implants can trigger a rare form of lymphoma that grows in the scar tissue surrounding the breasts. The agency identified about 450 cases of the cancer worldwide, including 12 deaths. Almost all of the cases involve a type of textured implant that is designed to stop implants from slipping and to minimize scar tissue. But the majority of the 19 panelists — including plastic surgeons and cancer experts — said it was too soon to remove the products from the market. "Do we want to get into the situation where we pull one sweetener and the replacement is even worse?" said Karla Ballman, a biostatistician at New York's Weill Cornell School of Medicine. "I think a knee jerk reaction of just pulling something without knowing what the replacement will be might get us into more trouble." Estimates of the frequency of the disease range from 1 in 3,000 women to 1 in 30,000. It grows slowly and can usually be successfully treated by removing the implants. The FDA said it has also received reports of the disease in smooth implants — which account for most of the U.S. market. Another panelist said a ban on textured implants would be an "extraordinary overreaction." But that opinion wasn't unanimous. The panel's consumer representative stressed the risk to women who get implants for reconstructive purposes after breast cancer surgery and could face a second cancer. "I think that's so much of a risk that they need to be taken off the market," said Roberta Brummert. Her comments set off cheers from dozens of women who attended the hearing. In the U.S., roughly 400,000 women get breast implants each year; 100,000 women get them after cancer surgery. 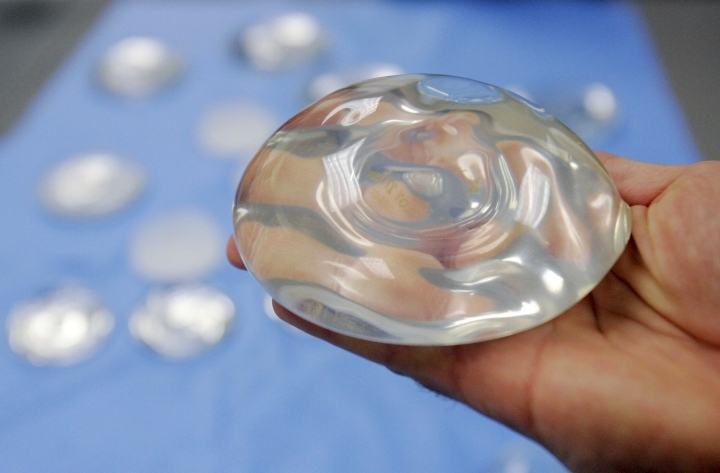 On Tuesday, the same FDA panel will make recommendations on studying and defining the risks of long-term chronic conditions with breast implants. Thousands of women have blamed their implants for a host of other chronic ailments, including rheumatoid arthritis, chronic fatigue and muscle pain. Patients and advocates have used the recent scrutiny to call for new warnings and restrictions on implants. "Don't ignore us. We are real," said Holly Davis, of Charleston, South Carolina. Davis, 60, said she experienced chronic pain, hair loss, rashes and memory loss after receiving silicone gel-filled implants following a double mastectomy in 2002. Davis said she learned her implants had ruptured when they were removed in 2017; her symptoms have since resolved. She and other patients want the FDA to require manufacturers to give standardized risk disclosure information to all women considering implants. "We need to know what we're signing up for — it can't be a surprise down the road," Davis said. In the U.S., most women choose silicone implants, which are considered more natural looking than saline implants. Both types have a silicone outer shell. The panelists also heard from researchers who theorize, based in part on animal studies, that silicone that leaks from implants can trigger or exacerbate immune system disorders in certain patients. In 1992, the FDA temporarily pulled silicone gel implants from the market because of fears they might cause breast cancer, lupus and other disorders. But when studies seemed to rule out most of the disease concern, regulators returned them to the market in 2006. But critics of that research noted its shortcomings at Monday's meeting. "The studies at that time were not very good and did not have the statistical power to determine rare diseases," said Diana Zuckerman, president of the nonprofit, National Center for Health Research, which published an analysis of more than 20 breast implant studies last year. The group concluded that virtually all were too small or too short or didn't focus on patients who had their implants long enough to develop problems. The FDA says on its website there is no "apparent association" between breast implants and chronic, debilitating diseases, such as connective tissue disease. However, earlier this month, the FDA appeared to signal a shift in its thinking. The agency said it would begin studying whether certain materials used in breast implants, metal hips and other devices can trigger health problems in patients. "We believe the current evidence, although limited, suggests some individuals may be predisposed to develop an immune-inflammatory reaction when exposed to select materials," the agency said in a statement. The Associated Press Health and Science Department receives support from the Howard Hughes Medical Institute's Department of Science Education. The AP is solely responsible for all content. RedShiftDaily was started out of fascination with mankind discoveries through peering out into the cosmos. Our team of enthusiasts are going to deliver only the best and latest progress in space technology and discovery so you too can share in the excitement. Copyright © 2015 - 2019 Redshift Daily. All Rights Reserved.